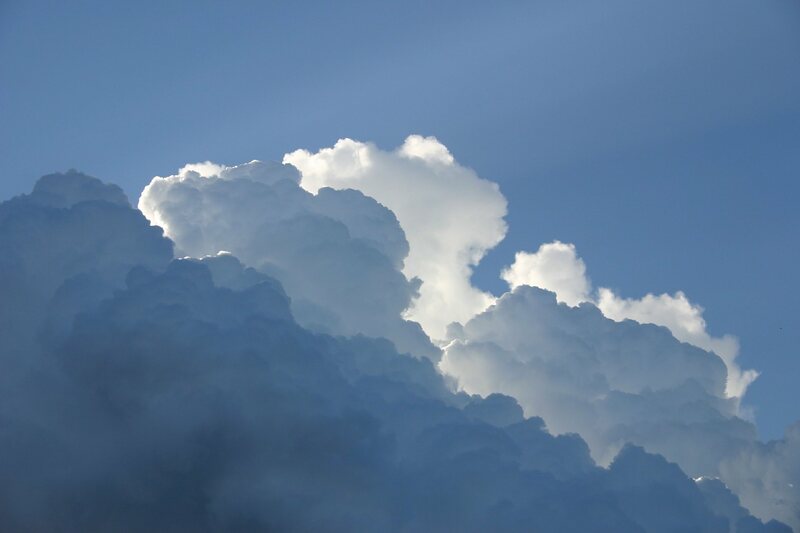 10 Ways to Explain "The Cloud"
For the last couple years, a sad little cloud has been making its way through the Internet, spreading its message of cold hard reality. 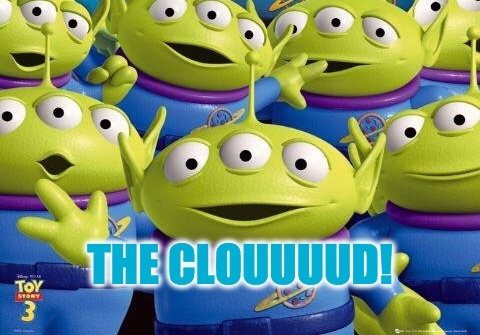 It mocks those who would say "The Clouuuud" with the same child-like sense of awe and wonder as those little aliens from Toy Story. "The Cloud" - part marketing term and part abstraction of, well, all those details you're paying someone else to worry about. What it actually is though, at the end of the day, is just someone else's computer. The "someone" might be a large corporation like Microsoft (Azure) or Amazon (AWS), employing hundreds of smart people to maintain thousands of servers and routers and load-balancers in huge data centers with a fast network, so you can rent computing power from them. Or it might be a company providing a service to you so you don't have to reinvent the wheel, like online backups. Or it might be one dude in his underwear running something out of his basement. Better keep that sump pump working Larry. 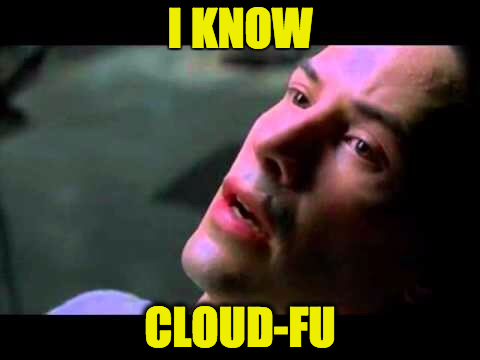 Still, what do you say when someone asks you what "The Cloud" is? You could go with the "someone else's computer" explanation or, well... here's a few other comparisons I came up with. It's like raking leaves in Autumn, but instead of raking 100,000 leaves in an hour, you hire 1,000 rakers for 30 seconds. Services like AWS let you rent far more computing power than you could afford at home, and when you're done with your big job you just hand it back. It's like mowing, but you're sick of it taking an hour. You could move faster (overclocking), or buy a larger mower (more RAM, faster CPU). Or you could rent 50 regular-size mowers for a couple minutes and have it done in moments. It's like cooking for 5 but 500 people show. You could cook faster, or split the food 100 ways (everyone's served but no one's thrilled with the service). Or you could hire 100 chefs until the rush is over. It's like planting 100 trees, but instead of digging all hundred holes yourself, you hire a hundred people to each dig one hole. It's like having a file cabinet for important documents and photos, but it's impervious to fire, floods and all other manner of natural disaster. Cloud services like Azure handle replication in case a hard disk crashes, so you don't have to. If you store a file on a decent cloud service, they're handling the details of providing a safe and secure data center. It's like finding your way to work is blocked, but then remembering you've already mapped out the next 50 fastest routes and just pick one. Cloudflare has a service "in the cloud" that (among other things) can cache your website all over the globe to protect against slowdowns, traffic spikes, DOS's, etc. It's like your kids, asking for juice and cookies every day, decide to invite all their friends' friends over. Instead of kicking them out of your house, you clone yourself a few times to handle all the requests until their irresponsible parents come to pick 'em up. It's like your house gets so messy you can't function in it. So you burn it to the ground and then build a basic home again to start over. DigitalOcean has a service "in the cloud" where you can near-instantly spin up machines and do pretty much whatever you want with them. You can destroy and recreate them with a button click. It's like creating a great meal once, but then you can save it right before you feed everyone and pull out a copy of it next time. No need to start from scratch. DigitalOcean also has "droplets", preconfigured setups with the exact software (i.e. WordPress or Ghost) that you want to run. All you have to do is spin it up and BAM you have a new blog in minutes. It's like storing all your documents in a file cabinet that increases in size when you need it. It just keeps getting deeper and deeper, without you having to worry about how, and nothing gets lost. A cloud service like Backblaze has thousands of hard drives available for storing users' files. You and I just have to upload our files, no matter how many, and they worry about adding more drives as necessary. They have a great blog too, and they frequently share inside peeks at what running a data center is like. Of course, you could just install a web app like WordPress on your own machine, install a self-hosted ssl cert, open the appropriate port on your router and direct traffic to your machine, buy a static IP or use a service like DynDNS or No-IP, get fast enough hardware and bandwidth to serve a ton of visitors, and setup backups and other loss-prevention and data-recovery procedures. Congrats. You are the cloud. Have any silly analogies of your own? How do you describe "The Cloud" to people?